Dessert apple. Fruit; small, round and a little flattened. Skin; smooth and shining, pale yellowish-green in the shade but clear yellow, with sometimes a faint tinge of orange or red next to the sun. flesh; white, crisp, brisk and juicy, with a vinous and sharply perfumed flavour, mealy and tasteless if kept only a few days. [HP pl.III/1878]. ‘The St. John apple is the earliest apple of the year. It is one of our oldest apples, but though generally known and popular, it escaped the notice of both Miller and Parkinson. 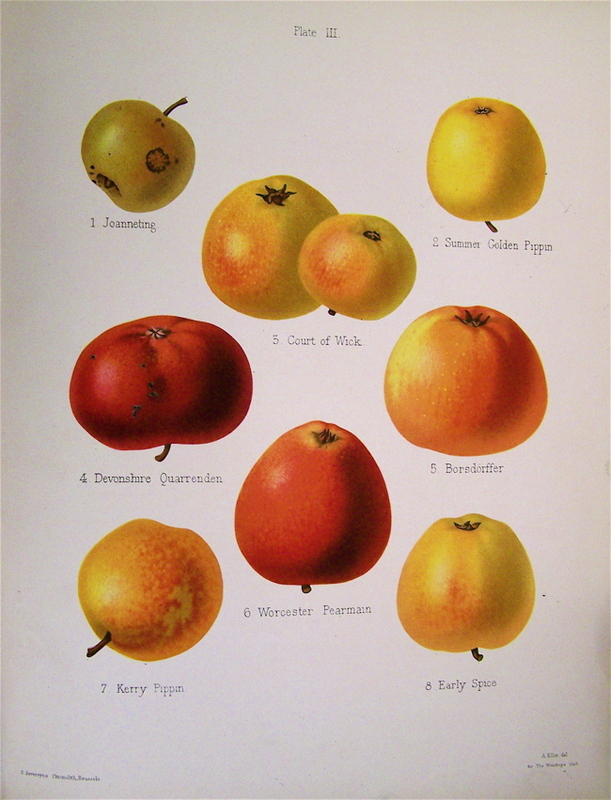 Rea first mentioned it in 1665, and describes it as “small, yellow, red-sided apple upon a wall, ripe the end of June”. It is at its greatest perfection when eaten from the tree.’ The tree is hardy and small and adapts to a pot on a small root stock. [HP pl.III/1878]. ‘This is one of our oldest apples, and although generally known and popular, seems to have escaped the notice of Miller, who does not even mention it any of the editions of his dictionary. As I have doubts of this being the Geneting of Parkinson — his figure being evidently intended for the Margaret, which in some districts is called Joanneting — the first mention we have of this variety is by Rea, in 1665, who describes it as "a small, yellow, red-sided apple, upon a wall, ripe in the end of June." The orthography which I have adopted in the nomenclature of this apple may, to some, at first sight, seem strange; but I am nevertheless persuaded it is the correct one. The different forms in which it has been written will be found in the synonymes given above, none of which afford any assistance as to the derivation or signification of the name. Abercrombie was the first who wrote it June-eating, as if in allusion to the period of its maturity, which is, however, not till the end of July. Dr. Johnson, in his Dictionary, writes it Gineting, and says it is a corruption of Janeton (Fr.) signifying Jane or Janet, having been so called from a person of that name. Ray says, "Pomum Ginettinum, quod unde dictum sit me latet." Indeed there does not seem ever to have been a correct definition given of it. In the middle ages, it was customary to make the festivals of the church, or saint's days, periods on which occurrences were to take place, or from which events were dated. Even in the present day, we hear the country people talking of some crop to be sown, or some other to be planted at Michaelmas, St. Martin's, or Saint Andrew's-tide. It was also the practice, during the reign of Popery in this country, as is still the case in all Roman Catholic countries, for parents to dedicate their children to some particular saint, as Jean Baptiste, on the recurrence of whose festival, all who are so named keep it as a holiday. So it was also in regard to fruits, which were named after the day about which they came to maturity. Thus, we have the Margaret Apple, so called from being ripe about St. Margaret's day — the 20th of July. The Magdalene, or Maudlin, from St. Magdalene's day — the 22nd of July. And in Curtius we find the Joannina, so called, "Quod circa divi Joannis Baptistae nativitatem esui sint." These are also noticed by J. B. Porta; he says, "Est genus alterum quod quia circa festum Divi Joannis maturiscit, vulgus Melo de San Giovanni dicitur." And according to Tragus, "Quae apud nos prima maturantur, Sanct Johans Opffel, Latine, Praecocia mala dicuntur." We see, therefore, that they were called Joannina, because they ripened about St. John's Day. We have also among the old French pears Amiré Joannet — the Admired, or Wonderful Little John, which Merlet informs us was so called, because it ripened about St. John's Day. If then we add to Joannet the termination ing, so general among our names of apples, we have Joanneting. There can be no doubt that this is the correct derivation, and signification of the name of this apple, and although the orthography may for a time appear singular, it will in the course of usage become as familiar as the other forms in which it as been written.’ [Hogg p.119/1851]. ‘Juneating: A small round fruit, much prized for its earliness.’ [David Crichton. NSW Hort. Mag. vol.1 p60/1864]. Listed in all catalogues [Apple no.21/1843]. There are two references to the quality of fruit in William Macarthur’s records. He considered this variety to be of little value under his conditions. Juneating. December-January. Good but uncertain. [Notebook no.9, MP A2948]. Juneating or Jenneting. Very early. Falls from the tree half ripe, of little utility. [Diary B, 1862, MP A2951].